After several failed attempts at going to the Bibou prix fixe, we finally got a reservation! I swear, every time we wanted to go, there was something stopping us. Either we tried to get a reservation too late, they were on vacation, or one of us wasn’t available on that said sunday. Then all the stars aligned and we finally went! Bibou is pocket-sized and adorably so. It’s warm and inviting. Warm baguette, anyone? Yes, please! The butter was also delicious. 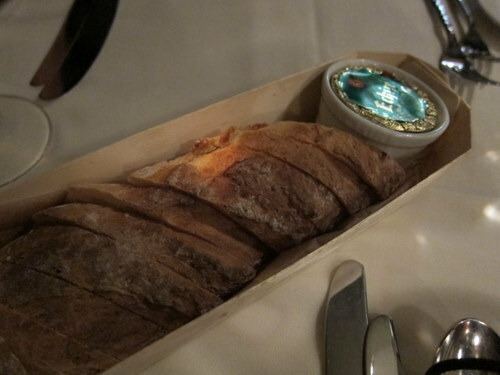 To start, we had the soup course, which was a bouillabase, with rouille toast. Oh, this was a cute bowl of seafoody goodness. It was hot, pungent, and a great start. E got the foie gras duo. 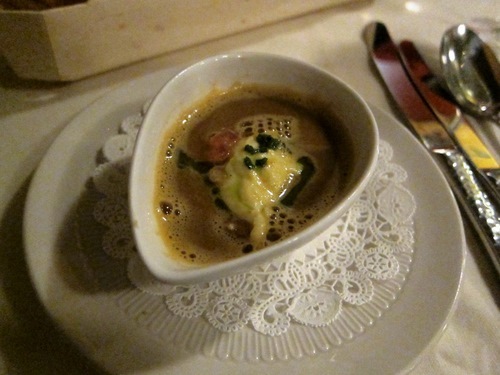 There was a foie gras creme brulee and a hunk of seared foie gras. For those of you who eat foie gras and like foie gras, this is the choice for you. I decided to be bold and get the escargot. It’s a french place and I wanted to go as french as possible! 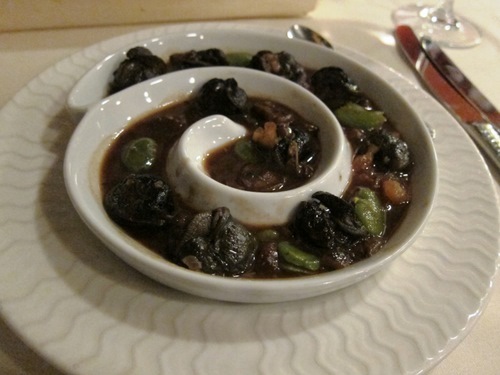 Escargot is of course, snails, and these were in a ragout with fava beans, mousseron mushroom, and flavored with tarragon. I like escargot! I’d only had it once before, maybe nearly 10 years ago, but those were just pretty plain and buttered. These were succulent and savory and I even enjoyed the mushrooms. There’s nothing scary about snails at all. They’re delicious. E wanted the octopus dish, but they had just run out. So instead, she got the striped bass prepared as the octopus had been. 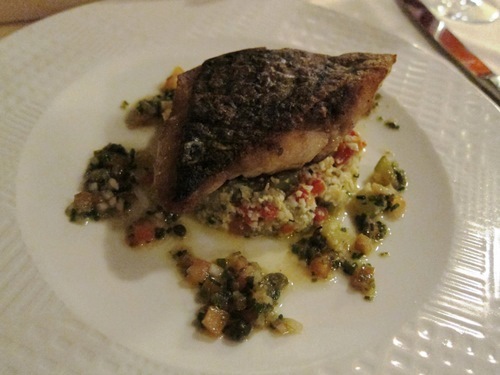 So here is the striped bass with with cauliflower couscous, tomatillo and red bell pepper, preserved lemon, in a caper brown butter. Yum! 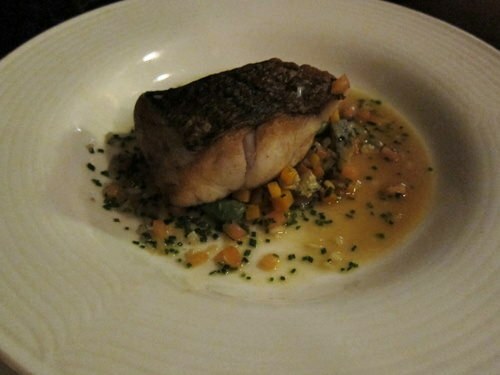 I got the regular striped bass dish, which was served with artichoke barigoule, fava beans, butternut squash, and barigoule emulsion. What does all that mean? I don’t know, it just tasted good. Both of the fish dishes were perfectly cooked. The fish was tender but with a slightly crispy skin. The accompanying flavors and veggies were mild, yet perfect for how it was prepared. We both ate it up! 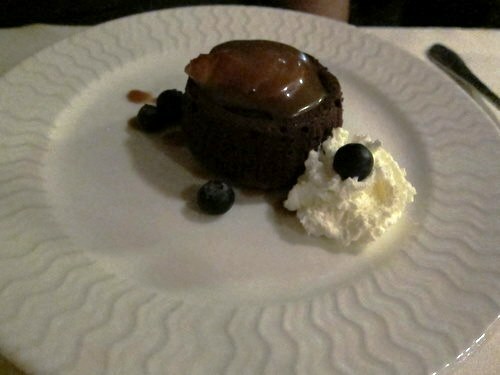 E is a chocolate girl, so she got the mimi’s chocolate cake with caramel sauce. Oh my word. This was an individual sized and baked cake. It was crazy good. 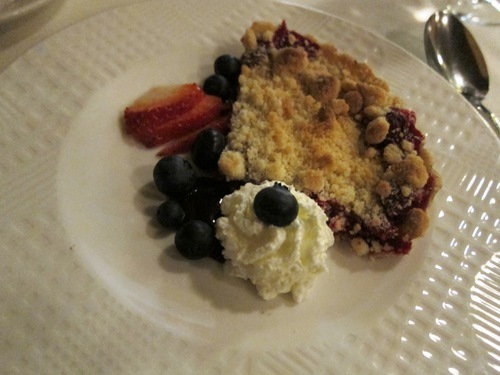 I prefer fruit in my desserts so I went with the crumble fresh cranberry pie. Jimminy cricket this was amazing too. The cranberry was fresh and tart and the accompanying berries were lovely and sweet. Really, every bite of this meal was superb. 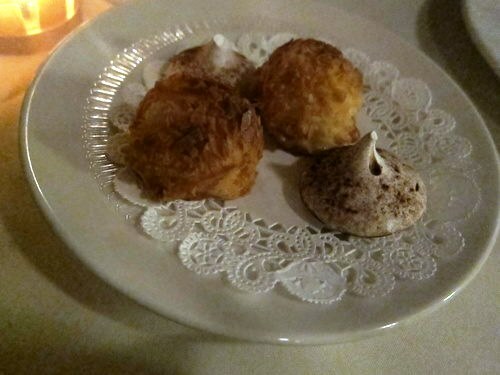 Just when we thought we were done, they brought out some macaroons and other sweet treats. How cute is this! And if that wasn’t enough, Chef Pierre came out and said hello to us (and everyone else). We were both elated, stuffed, and a bit starstruck to say anything intelligible! We both thoroughly enjoyed our meal here, and the entire experience. 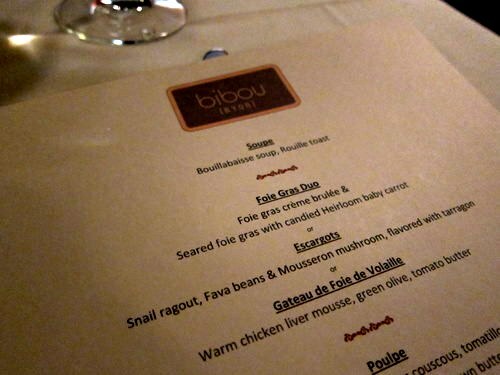 I still don’t know jack about french food, but places like Bibou make me want to try it again and again. I still marvel about the intense Frenchness of that whole experience. 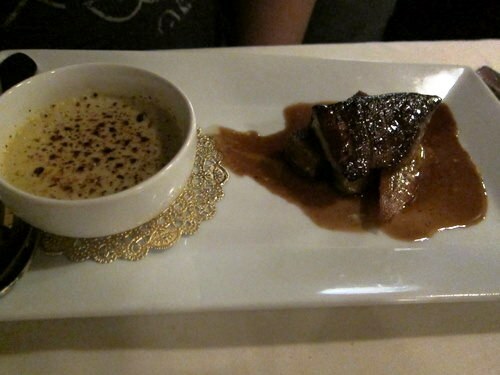 And that foie gras “creme brulee” was amaaaaaazing!